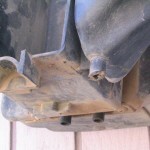 Note the chain damage to the vent tube cover. 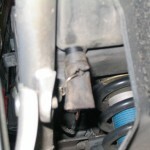 Here the airbox drain tube has been ground down by the chain. Back in the last century (1990) when I purchased my first KLR650 (1989 A-3), one of the first things I noticed was how much chain slack the factory recommended (50 – 55mm or slightly more than 2”). I put the bike up on my Handy Lift and studied the situation concluding that the factory was correct. Get the bike’s rear wheel off the ground. At the halfway point between the center of the rear axle and center of the counter shaft, put a punch mark on the bottom outside edge of the swing arm. Rotate the rear wheel slowly until you find the chain’s tightest spot and place it under the punch mark. Now push the chain roller located under the punch mark up hard and with a millimeter scale or tape, measure the distance between the center of the roller pin to the bottom of the swing arm behind the punch mark. Now, without moving the chain, push the same roller down hard and again measure from the center of the same roller pin to the bottom of the swing arm. Finally, subtract the small number from the big one and you have your chain slack (i.e. 65 minus 15 equals 50; bingo, perfect). I suspect many long-travel multisurface motorcycle owners do a poor job of chain adjustment. I have seen too many stretched chains, prematurely worn out sprockets, and chain defensors worn through on occasion to the aluminum. Additionally, most of the approximately two dozen KLR engines I’ve disassembled have had output bearings (behind the counter sprocket) that needed replacing. So, unless you enjoy pulling the engine apart to replace the output bearing, be very aware of proper chain adjustment. Of my million plus miles on motorcycles since leaving the Navy Hospital Corps after the Korean War in 1955, 275,000 plus miles have been recorded on several KLR650A models. Pauline’s favorite, an “A” I purchased new from now defunct San Diego House of Motorcycles in 1993 has been ridden mostly two-up with tens of thousands of hard dirt miles all over Baja and the Rockies. In all those miles we have never had an output shaft or bearing failure. In fact, in 275,000 plus KLR miles the only engine stoppage I ever had was due to a plugged up/defective one-way intake valve in the gas cap which I fixed forever (it’s a chronic problem folks!! But that’s another story). Speaking of drive-line reliability, Mr. Kurt Grife, another high mileage rider, with well into six figures riding KL650A’s on and off road has recently passed 43,000 miles on his present chain and sprockets, which are still in amazingly good condition. From time to time we’ll report Kurt’s KLR mileage until he is forced to replace his drive components. How does Kurt do it? He keeps his chain properly adjusted. He keeps his chain clean and free of the gritty stuff. He keeps the chain lubed with quality O-ring safe chain lube (DuPont). Kurt’s bike is equipped with the first Top Gun Chain Master outside of our group. NOTE: Kurt reports the Chain Master has been limiting upper chain run slack since the drive components were installed. 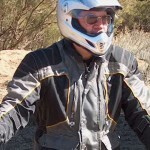 The point is you don’t have to be a Kurt Grife, Rod Morris, Ed Runnels, Todd Vosper, or the like to have a long lasting healthy motorcycle drive system from counter shaft to rear axle. All you have to do is be a diligent mechanical maintainer. Finally, consider the following: Running chain slack with rider in place is reduced by proper ride height putting the rear wheel within approximately 16% of dead center of its travel arc (countershaft, swing arm pivot’ and rear axle all lined up). On the other hand at the top of the arc with the bump rubber fifty percent squashed, you have approximately two inches of slack chain headed north. The Chain Master is designed to intercept and redirect the chain on the way up and reduce the slack in the process (less slack equals less trauma and wear). If you run lowering links the Chain Master is even more important since the presence of the lowering links creates even more upward chain movement. Have a very heavy spring over pre-loaded. Have the proper spring (not the wimpy 5.05kg stock unit) and ride height but ride casually only on pavement (MMP has the best KLR springs). Have the chain adjusted too tightly; in which case they are headed for big trouble. Chain Master that we will soon have one for the DR650SE. The DR has an upper chain wheel, but it is too far forward, too low and poorly mounted. It is not uncommon for DR off-road riders (including me) to find the stock chain wheel assembly missing with a large hole in the frame at the mounting point. 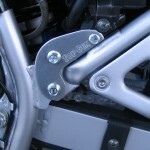 Like our KLR Chain Master the unit for the DR will be bullet proof, easy to install, and adjustable. Next week I’m headed for frame building icon Rob North’s shop for frame repair on my ’09 DR650SE. Suzuki refused to stand behind their chronic frame problem, but we will fix it good with a beautiful Rob North repair and Top Gun DR650SE Chain Master.